Logona Age Protection Nutrition Cream helps to support the natural repair function of the skin in order to reduce the signs of aging. The results of a clinical trial show a 33% improvement in moisture as well as a 30% reduction in the depth of wrinkles and fine lines. Rather than using several different creams for daytime and night-time, this luxurious and high quality cream is suitable for both day and night skin care. As you mature, your skin care routine should evolve to suit the changing needs of your skin. Mature skin needs gentle loving care to keep it nourished and healthy looking and to treat the full range of skin aging issues. 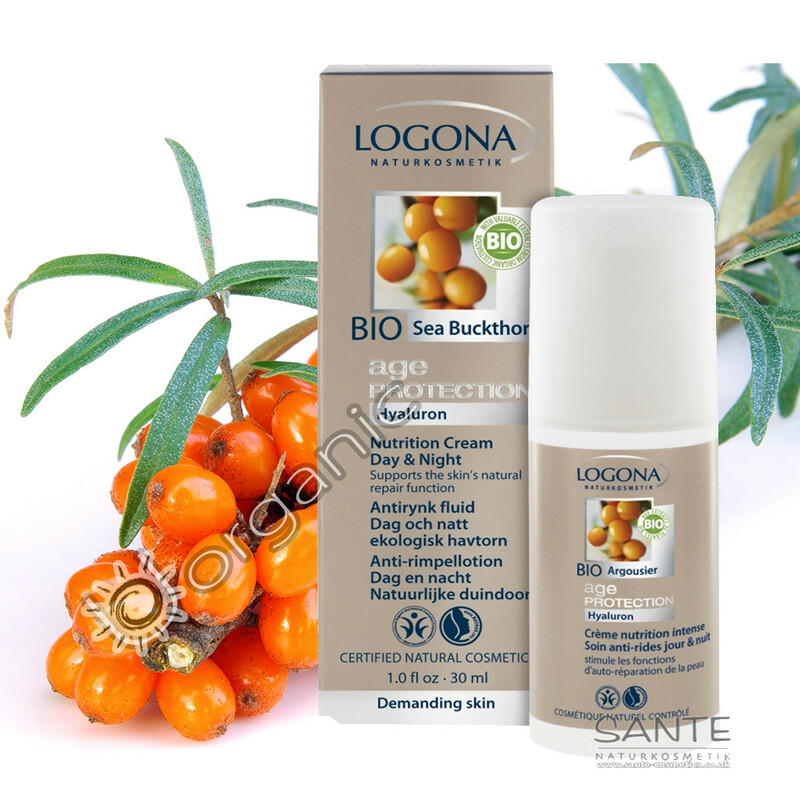 Logona Age Protection Nutrition Cream Day and Night is specially formulated with botanical oils which deliver long lasting moisture to protect and care for your skin. This gentle cream is made with a blend of ingredients carefully chosen to tighten and stimulate the skin, including Shea butter, organic jojoba oil, grape seed oil and Sea buckthorn oil. These natural ingredients will enhance your skin’s own repair functions, whether you wear the cream during the day or at night. The hyaluronic acid within this day and night cream will help to retain moisture and restore deep long lasting hydration in the skin. Extract of bamboo helps to improve skin’s elasticity and the addition of extract of quince adds an element of freshness. Logona Age Protection Nutrition Cream Day and Night will help to diminish the facial signs of stress and fatigue, leaving you with healthier and younger looking skin. Usage: Shake the bottle before applying. After cleansing your skin in the morning or evening, pat the moisturiser into your skin and gently massage with your fingertips. This cream is designed to be used at night as well as in the morning, eliminating the need for two different types of cream.